Grieg's Holberg Suite is a collection of delightfully fresh baroque-style dances, inspired by a famous 17th century Norwegian playwright. The Suite is actually called "From Holberg's Time". Grieg created it as a personal tribute for the 200th anniversary of Ludwig Holberg. 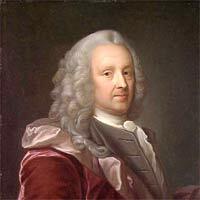 Holberg was a Danish-Norwegian playwright, born in Bergen (like Grieg) in 1684. Inspired by the Enlightenment, he was a considerate philanthropist. He wrote books encouraging people to think for themselves, and his comedies became very highly regarded. So in 1884, 200 years after Holberg was born, the city of Bergen wanted to host a spectacular outdoor celebration. They asked Grieg, by then Norway's most famous composer, to compose a grand cantata and conduct it. But Grieg didn't like the task, or the prospect of conducting it outdoors in harsh winter weather. He abandoned the cantata idea, and ended up conducting a string orchestra version of a popular piano suite he wrote the previous year. 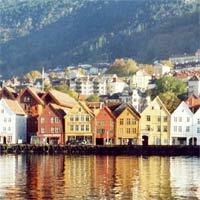 The Holberg Suite premiered in December 1884 in Bergen, the birthplace of both Grieg and Holberg. But Grieg gives the pieces his own magical touch and romantic style, making them fresh. It's only the structure and names that are 18th-century. It's like the neoclassical composers of the 20th century: a composer using an older style of music but giving it a 'modern' taste. The music also shows off Grieg's great skill with harmonies that are both simple but powerfully moving, and his characteristically pure, clean, and nourishing sound. Originally the suite was actually for solo piano, by the instrument which Grieg wrote for the most. Both the piano and more well-known string orchestra version are cherished by many listeners. Sarabande (Andante). A traditional baroque dance, originally from the Americas. This movement contrasts nicely with the first movement, since it has a more peaceful and thoughtful mood. It's as if the wise Holberg is gently explaining to the young Holberg that he has to take life slowly. Gavotte (Allegretto). This near-perfect bridge takes elements from the second movement. It's again optimistic, but with a more measured, quietly aristocratic sound. This is likely because a Gavotte was a type of baroque court dance (but originally a French country dance). Rigaudon (Allegro con brio). This final movement echoes the liveliness of the prelude, and features the imagined sounds of a rural fiddle-player. I'm going to recommend recordings of the original piano piece, and the later version for string orchestra. 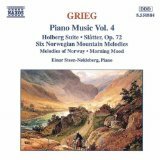 The recording by pianist and Grieg expert Einar Steen-Nokleberg, on Naxos (part of their complete Grieg piano music series), is wonderful and highly recommended. Steen-Nokleberg injects these pieces with color and manages to make each individual strand of melody unique and interesting. Although I feel his rhythms could be more pronounces and 'dance-like' (except in the last piece where he plays brilliantly), the overall effect is superb. And for the definitive recording of the string orchestra version, look no further than the SACD recording by Ole Kristian Ruud and Bergen Philharmonic Orchestra. But this recording also has a fresh, magical sound, great tempi, and a perfectly balanced orchestra. Excellent! You might also be interested in Grieg's Peer Gynt Suite.